A retrospective of Anne Slaughter’s work “TERRA INCOGNITA” Anne Slaughter, 40 Years was held in the spring of 2006 at the nationally known non-profit SECOND STREET GALLERY and at LES YEUX DU MONDE GALLERY in Charlottesville, Virginia. 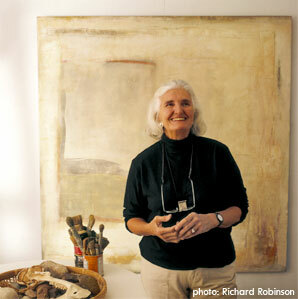 Anne Slaughter has had over 20 solo and many group exhibitions in the United States and Europe. She showed her work for a decade at the TROYER, FITZPATRICK & LASSMAN GALLERY in Washington DC, and has been included in curated shows at the Corcoran Gallery of Art. Her work has been extensively reviewed, including several articles in the Washington Post by critic Ferdinand Protzman and in the Art Section of Southern Accents magazine. Slaughter’s works are in corporate and private collections across the United States and Europe. One of her work has recently been acquired by the University of Virginia Art Museum. She was educated at the University Libre de Bruxelles in Brussels, Belgium, where she was born, and at the University of Virginia in Charlottesville, VA, where she was one of the founders of the McGuffey Art Center.